It's one of the things every new and nervous parent wants to know - what does diaper rash look like and what's the best way to deal with it? Fortunately, when it comes to a baby's skin ailments, diaper rash is easily identifiable, treatable and even preventable. Most cases of diaper rash will present as mild redness and scaling all over the diaper region. If the rash is particularly bad, it will cause pimples, blisters and other sores. 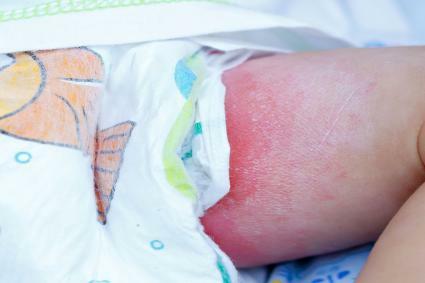 If diaper rash becomes infected, the rash will usually be bright red and the skin can swell. You may even see small red patches or spots extending past the rash and even past the diaper area. Both you and your baby will be unhappy. For those who are wondering what does diaper rash look like when it's an irritation caused by wet skin or an allergy to either the diaper, the baby wipes or assorted creams, the answer is that the rash itself will always look the same. The other good news is that you can treat a rash in the same way, whatever its cause. And once you determine what that cause is, you can try to remove it and thus hopefully prevent diaper rash altogether. The majority of diaper rashes are caused by skin irritation, usually because the baby is wet for too long or the diaper chafes. Some babies will become irritated by a particular diaper or baby wipe, or will react to the soap used to launder a cloth diaper. Antibiotics, used either by the baby or a breastfeeding mother, can bring on a rash, as can excessive heat and/or moisture. The best way to treat diaper rash is to prevent it in the first place, which is accomplished by keeping the diaper area clean, cool and dry. A lot of parents are nervous about the idea of a baby going without a diaper, but in fact, allowing the skin to breathe naturally is one of the best things you can do for your baby's well-being. You can at least let your baby sleep without a diaper - simply tuck an open cloth diaper underneath your baby when putting him down. If you want to feel extra secure with a boy, you can lay another diaper over him. Babies often urinate right after falling asleep, so check the diaper soon after and replace it - babies sleep too hard to be disturbed by this movement. There are different schools of thought on using cloth versus disposable diapers and diaper rash. Most parents and caretakers agree that it ultimately depends on the baby. Some skin is simply more prone to rashes than others. The advantages of cloth diapers, besides that they are better for the environment and can work out to be less expensive overall, is that they allow your baby's skin to breathe fully, so that germs have less chance to fester. But unless you use an extra liner, you will have to be quick about changing the diaper, because the cloth diaper holds in wetness, rather than wicking it away. Then again, the gel that can wick wetness in a disposable can also be an allergen. Since cloth really is so much better for all concerned, try to use it and just keep on top of changing. When a rash does occur, avoid any creams that contain boric acid, camphor, phenol, methyl salicylate or compound of benzoin tincture. These can all be harmful. You must also avoid talcum powder or cornstarch. Instead, opt for a more natural treatment such as Burt's Bees diaper cream. It's mild, but it does the trick and is organic to boot! There are a few other good ointments and creams to consider as well.